After a number of relocations around the inner city of Utrecht, the Faculty of Geosciences has finally found a new home at the Utrecht Science Park (De Uithof), the place where research and knowledge meet. The official opening of the Faculty of Geosciences of Utrecht University took place on 14 September. After an opening speech by Professor Piet Hoekstra, dean of the Faculty of Geosciences, there were several short workshops (Better Future sessions) on relevant societal issues we are facing together. Being the architect, it was great to see that the building designed by Inbo is used with this much enthusiasm. During the opening, we were told time and time again that the clear and proud presentations were certainly not only shown for this special event. The building encourages the staff to come out with their work and seek opportunities for collaboration. The building truly is an inspiring learning and working environment for both staff and master’s students of the Faculty of Geosciences. The new faculty feels good as soon as one enters the building. 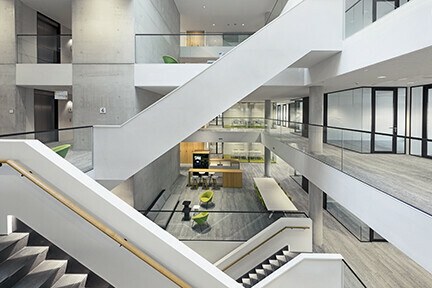 The large open spaces represent the connection that is made between staff and students. The building is a total design in which the building’s architecture, the interior, the lighting design and the interior design reinforce each other to form a coherent spatial whole. The interior was designed with love and attention to detail; material choices were kept modest and seemingly self-evident. And that was visible in the pride of the university community during the opening. The building was designed with great focus on innovation and sustainability, in line with Utrecht University’s ambition, resulting in a BREEAM Excellent certificate.